The patterns 'Ladder 2' and 'Diamond' are contained in the 'Wood & Glass' package that you can download from the Boards page. Solution 60 medium Sudoku puzzles with 10x10 cells and brickwall pattern areas (23 KB). Solution 60 medium Sudoku puzzles with 10x10 cells and ladder 2 pattern areas (39 KB). Solution 60 medium Sudoku puzzles with 10x10 cells and diagonal pattern areas (67 KB). Solution 60 medium Sudoku puzzles with 10x10 cells and diamond pattern areas (43 KB). 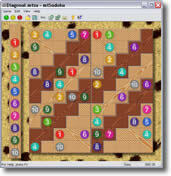 Solution 60 easy Sudoku puzzles with 10x10 cells and brickwall pattern areas (28 KB). Solution 60 easy Sudoku puzzles with 10x10 cells and ladder 2 pattern areas (45 KB). Solution 60 easy Sudoku puzzles with 10x10 cells and diagonal pattern areas (63 KB). Solution 60 easy Sudoku puzzles with 10x10 cells and diamond pattern areas (48 KB). Solution 60 easy Sudoku puzzles with 10x10 cells and diagonal pattern areas (62 KB).